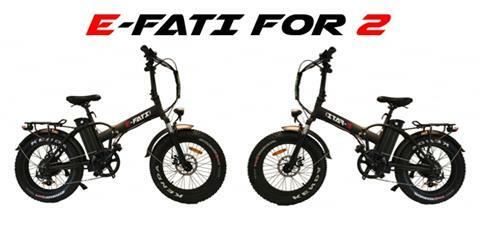 The indicated prices correspond to the original E-FATI's, without changes. as well as the manpower for the realization of the modifications to carry out will be invoiced in addition. Please ask your dealer for a detailed quote. *The indicated prices correspond to the original E-FATI's, without changes. To meet the demand of our customers, we have prepared a special offer E-FATI FOR 2. Join us, because the revolution is on the way for zero gas emissions in our cities and countryside. Several thousand customers trust us since the creation of E-fati in 2016!